Fifteen minutes, every day, stitching, seam ripping, pinning, reading the pattern, throwing it across the room. I can't for the life of me figure out how to get the bottom together. I suspect, despite sewing that darn circle five times, I've got the liner attached upside down. And just when I finally got the circle in with no bunching. I'm taking a quilting class tomorrow, so I'm taking the stupid bag to see if my instructor can figure out how to finish it. 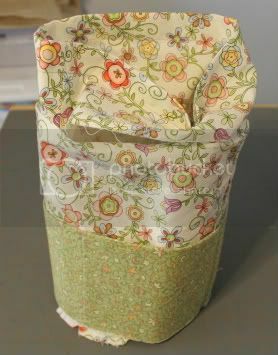 And then the next time someone asks me to sew a circle bag, I'm going to say, "Sorry, I only make square things."